Selecting color in the Color Picker in Photoshop Elements 11 is fine when you want to make a single color selection and use it once. However, if you want to create your own custom color panel and reuse colors, you want an easier method for choosing foreground and background colors — and a way to reuse the same colors easily. The Color Swatches panel provides you with exactly what you need to create a personal color panel and easily access colors when painting on a canvas or filling selections on an image. To open the Color Swatches panel, choose Window→Color Swatches. The Color Swatches panel opens as a floating panel. Mac OS: If you’re using a Mac and looking at an image created on a Windows machine, choose this panel to load a color panel that displays color accurately on the Mac. If you’re using OS X Snow Leopard or higher, the colors are identical between platforms. Photo Filter Colors: This swatch set is a narrow range of colors consistent with those you apply using Photo Filters. Web Hues: This swatch set displays hues that are Web Safe colors. Because most computers use 24-bit color, you needn’t be concerned with Web Safe colors for web designs. 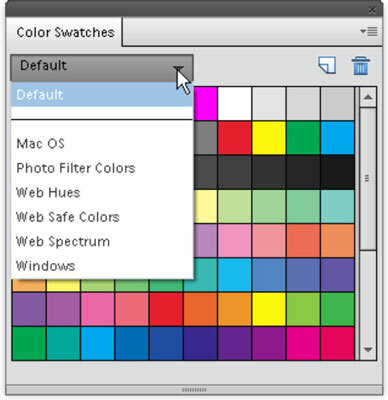 Web Safe Colors: This set of swatches displays colors in a Web Safe panel. As with hues, you aren’t likely to use Web Safe colors for any designs. Web Spectrum: This swatch set displays the entire spectrum of Web Safe colors. Windows: This color set contains all the colors that display properly on a Windows machine. The Color Picker has all the colors you can use in a given color mode. You may want to add more colors to one of the color swatch sets when you select different colors in the Color Picker. You might also want to delete some colors from a swatch set, or you may want to save your new swatch set as a library that you can load in Elements so you can use the new custom colors. Open the Color Swatches panel. Choose Window→Color Swatches to open the panel. Delete colors from the Default panel. Choose a color you don’t want to appear in your custom color panel. Press the Alt (Option) key, and the cursor changes to a Scissors icon. Click a color swatch with the Alt (Option) key depressed to delete the color. Continue deleting all the colors you don’t want in your custom color set. Select a new color to add to your custom color set and click OK.
Click the Foreground Color Swatch in the Tools panel. When the Color Picker opens, click a color you want to add to your new set. Click OK, and the new color appears as the foreground color. Add the foreground color to the set. Click the Panel menu icon in the Color Swatches panel to open a flyout menu. From the menu choices, choose New Swatch. The Color Swatch Name dialog box opens. The color is derived from the current foreground color to the left of the Name text box. Type a name for the color swatch and click OK. The new swatch is added to the Color Swatches panel. Continue doing Steps 3 and 4 to add new colors to the Swatches panel. Open the Panel menu and choose Save Swatches. A Save dialog box opens with the Color Swatches folder selected as the target folder. Be sure to not change the folder location. Type a name for your new swatches and click OK. 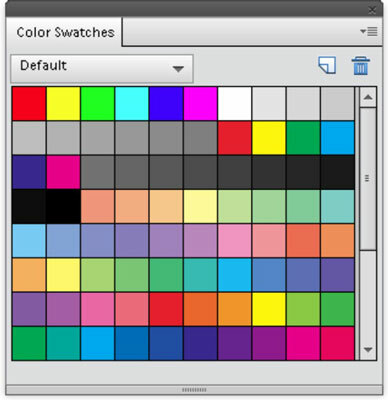 If you want to share color swatches with other Elements users or users of many Adobe programs such as Adobe InDesign, Illustrator, Photoshop, and Flash Pro, use the menu option Save Swatches for Exchange. You have saved a set of swatches without disturbing the original Default set. You can always return to the Default set by selecting Default. The original set remains intact. If you created a custom set of color swatches and then chose one of the presets from the Default drop-down list, the custom colors you created aren’t visible in the Color Swatches panel. To see them there and use them, you have to load the swatches back into the Color Swatches panel. To load swatches, open the Panel menu and choose Load Swatches. A Load dialog box appears with the target folder pointing to the Elements Color Swatches folder. Here you find all the custom color swatches you saved from the Color Swatches panel. Select a file in the Load dialog box and click Open. The custom color swatches set opens in the Color Swatches panel. If you want to replace colors in an existing Color Swatches panel, you can do so by selecting another menu command in the Panel menu. Choose Replace Swatches in this menu, and the Load dialog box opens. Select a file in the Custom Colors folder, and the colors in the file you selected replace the existing swatches. Another item in the menu is Save Swatches for Exchange. If you want to exchange the palette with another user, you choose this command. A Save dialog box opens that defaults to the Color Swatches folder location inside your Elements 11 folder. When you provide a name and click Save, the file is saved with an ASE extension. ASE is the Adobe Swatch Exchange format. You can save color swatches in this format, and you can load swatches saved in this format in a number of different Adobe applications, including Elements 11.